From giant glasses of frozen margarita and unlimited corn chips and salsa to gargantuan servings of nachos and fat burritos, anyone that has been to an El Camino Cantina knows it doesn’t do things by halves. Inspired by the neon-lit eateries of the Lone Star State, Rockpool Dining Group’s vibrant concept looks to offer an authentic Tex-Mex experience – plating up dishes synonymous with the popular border cuisine. El Camino Cantina kicks of its three-day opening fiesta this evening, showcasing its jam-packed menu to Brisbane eaters for the first time. Long before he was CEO of Rockpool Dining Group, Thomas Pash worked as a waiter, dishwasher and host at a Mexican restaurant on the outskirts of Houston. It was here that the native Texan first found his love for Tex-Mex dining and its big portions, bold flavours and bright atmosphere. Nearly 35 years on and Thomas has come full circle, adding a Tex-Mex style concept to the portfolio of his burgeoning hospitality group. 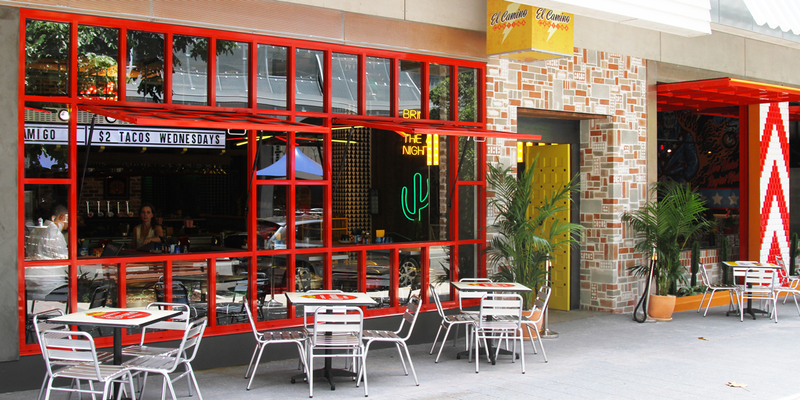 El Camino Cantina first opened at The Rocks in Sydney, before expanding to Manly Wharf and now the bustling Bowen Hills hub of King Street. 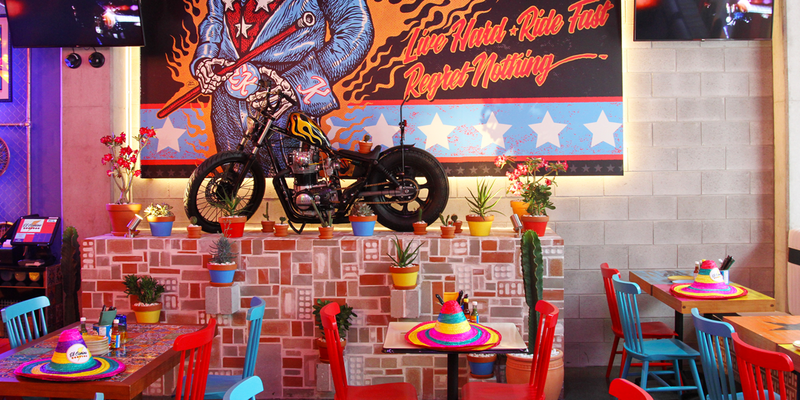 Inspired by the multitude of Tex-Mex eateries across Texas, El Camino Cantina looks to translate the concept’s casual appeal with a splash of colour and freshness – we’re talking across the fit-out and the menu. Most eaters knowledgeable in Mexican fare can probably identify a few of the usual suspects without glancing at the menu, but El Camino’s kitchen bucks expectations with some tasty surprises. Like tacos? El Camino’s got nine of ‘em. Pick and mix between the likes of cheeseburger, black-bean hummus and coffee-spiced smoked belly. Fresh char-grilled fajitas can be stuffed with hickory-smoked brisket or lime and pepper angus steak (don’t forget the cheese – it oozes out of these bad boys). Burritos stuffed with brisket and queso look set to pop, while a mountain of nachos or the appropriately titled Amigos Platter are perfect for sharing. Oh, and before we forget – there’s a cart dispensing unlimited corn chips and salsa. As for the drinks, well, you already know about the margaritas. Enjoy them frozen or on the rocks in either a 15oz or 24oz glass or in a giant shared tower. The bar also serves up a selection of local, regional or Mexican draught beers, more than 100 tequilas and mezcals, sangria jugs, wine and specialty cocktails, which is good news as some of the food can be pretty spicy. 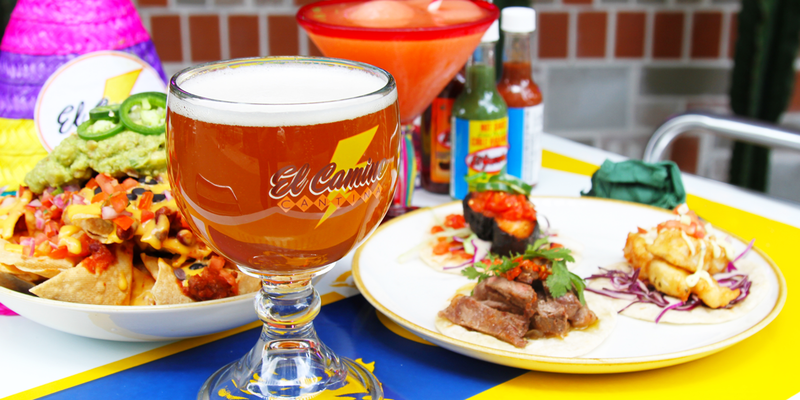 El Camino Cantina opens tonight, commencing three nights of deals and margarita-fuelled revelry. Hit up our Stumble Guide for more details.